UK players of Net Entertainment’s latest online slots release may well notice that a number of the smaller participants bear a passing resemblance to the Smash mash potato characters from the 1970s (have a look here for a reminder). Aside from that, this is yet another stunning looking slot from Net Ent and this company now appears to be producing games which are a joy just watch, regardless of whether you are winning or losing. We’d better write a bit about how Eggomatic plays though and you’ll guess from the name that it’s chicken/egg related or to be more specific, robot chickens and metal eggs. There are five metal chicks (brown, blue, green, pink and red) and five chickens of corresponding colours and all the action takes place in a kind of battery farm, conveyor belt arrangement. There’s also a big blue wild chicken symbol. 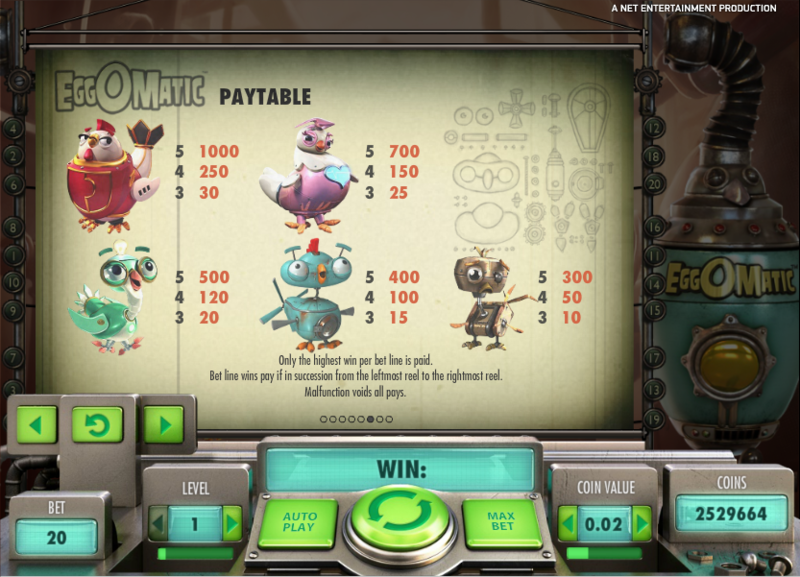 There is no separate bonus game as such but at regular intervals the Eggomatic machine on the right hand side of the screen emits a special egg which lands on the conveyor above the reels. It begins on the far right reel and with each spin the egg moves one reel to the left before disappearing off to the left of the screen. Spreading Wild Egg – catching this egg will turn all surrounding symbols into wilds, increasing the chances of creating winning combos. Free Spins Egg – grab this egg and win a random number of spins between seven and fifty. More free spins can be won will in this feature. Coin Win Egg – a number of coins are won by catching this egg and the level of the win depends on the stakes you are playing. It will be a prize between 50 and 2500 coins. Surprise Egg – nab this egg for a random award of one of the above prizes. To make the point once more, the animation is stunning, from the intro movie right down to the way the characters are zapped and dispense coins when featuring in a winning payline. 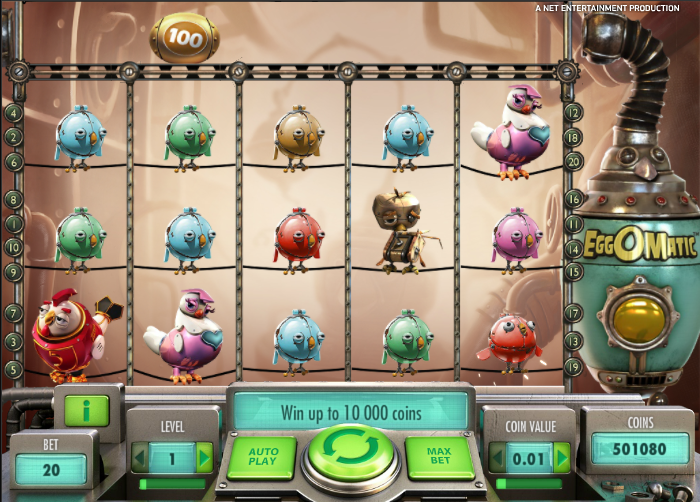 Eggomatic is an excellent slot and we don’t say that too often. There are five reels and twenty fixed paylines so the minimum bet per spin is €0.20 and the maximum €200.00.